As well as the Alpha A7R III, Sony has also announced a new full-frame E-mount lens, the FE 24-105mm f/4 G OSS standard zoom. Featuring a constant maximum aperture of f/4, the lens also promises fast, precise and quiet autofocus. Sony also claims it should deliver excellent corner-to-corner sharpness throughout the entirety of its zoom range, while also producing beautifully rendered ‘bokeh’ or background defocus at all focal lengths. The lens design features four aspherical lens elements, two of which are high precision AA (advanced aspherical) lenses, as well as three strategically located ED (Extra-low Dispersion) glass elements to help minimize chromatic aberration. The lens weighs in at 663g and is both dust and moisture resistant, while it also includes a built-in optical image stabilization system. 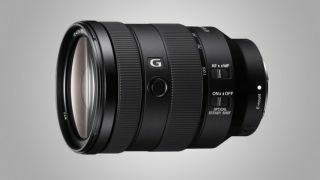 The new FE 24-105mm f/4 G OSS standard zoom will ship in November 2017, priced at approximately £1,200/$1,299/AU$2,099. For those wanting longer reaching glass for their Sony E-mount cameras, Sony today announced the development of the long-awaited FE 400mm f/2.8 GM OSS super telephoto lens, with a target launch date some time in mid 2018. As soon as we get additional details and a specification, we'll share with you.